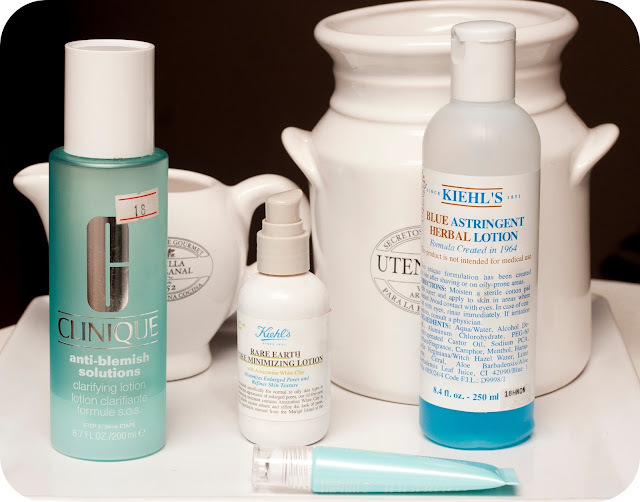 Talking about routine, today I wanted to show you my favorite summer skincare products. For those who check my blog for the first time, I am from Argentina, I have Oily Acne-prone skin and it's summer here so I've been using these products since October-November and now it's a good time to talk about them. For those who are enjoying winter right now, keep an eye on this post because it may help you to choose the right products for summer! Hoy les quería mostrar mis productos favoritos de este verano, los vengo usando desde octubre-noviembre y pienso que ahora es buen momento para habar de ellos! Before I start talking about them, I wanted to say that I did a research on these products before purchasing them. I do not like to waste my time and money trying products that may be cheaper and damage my skin so for that reason, I prefer to spend a little more and get High-end skincare products that had good reviews. 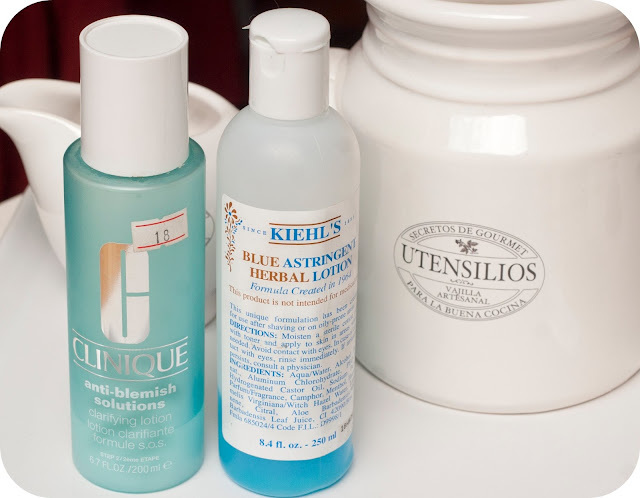 Kiehl's Blue Astringent Herbal Lotion: This lotion is specially formulated for oily skin. Contains Alcohol, Camphor, a naturally derived from an eastern evergreen tree which give a cooling effect to the skin, Menthol and Sodium PCA, a naturally humectant in the skin. I use this product in my morning skincare routine, after I wash my face with water and cleanse it with Bioderma Sebium H20. Now that the weather is so hot here, I wake up with a gross layer of oil in my skin and this product really helps to clean and control it. I believe it's important not to abuse of this product since it can be drying, for that reason I use it only once a day. A good plus? Men can use it too! It's is recommended as an after shaving lotion. Esta loción está específicamente hecha para pieles oleosas. Contiene alcohol, Camphor, Mentol y Sodium PCA. Usé este producto todas las mañana después de lavarme la cara con agua y limpiarla con Bioderma Sebium. Realmente ayuda a controlar los brillos y a mantener la piel lo más balanceada posible. Creo que es importante no abusar de este producto ya que puede ser algo secativo. Un buen plus? Los hombres también lo pueden usar ya que está indicado como lotion after shaving. Clinique Anti-Blemish Solutions Clarifying Lotion ($18): After using the Oil-free moisturizer from the same line and getting great results I had to try this product. Claims to reduce excess oil that can led to breakouts. It does! It's a great product, I use it in my night skincare routine since it's not as harsh as the Kiehl's lotion. This one has white powders in the bottom, for that reason you have to shake well before you use. Feels almost like water but it does control my skin. I believe is quite healing for that reason I let it act during my sleeptime. Después de usar la crema hidratante de esta misma línea, no podía dejar de probar el toner. Dice reducir el exceso de aceites que causan granos. Creo que lo hace! Es un muy buen producto. Lo uso antes de dormir ya que es mas suave que el de Kiehl's. Tiene polvo blanco en el fondo, por lo tanto hay que agitar bien antes de usar. Creo que aunque se sienta como agua tiene poderes curativos por eso lo dejo actuar toda la noche. Kiehl's Rare Earth Pore Minimizing lotion/moisturizer ($29): I would say this is not a lotion at all, it's a moisturizer. I did a blogpost about this product here, but I'll be brief about it. It's a great lightweight moisturizer that contains amazonian white clay and it's for all skin types. My favorite for summer and a huge plus, reduces the appearance of pores, so it's a moisturizer + primer. Score! Biotherm Aquasource Eye Perfector ($31): "A transparent ultra-fresh gel containing thermal plankton from the equivalent of 5,000 litres of thermal spa water, calcium and manganese. 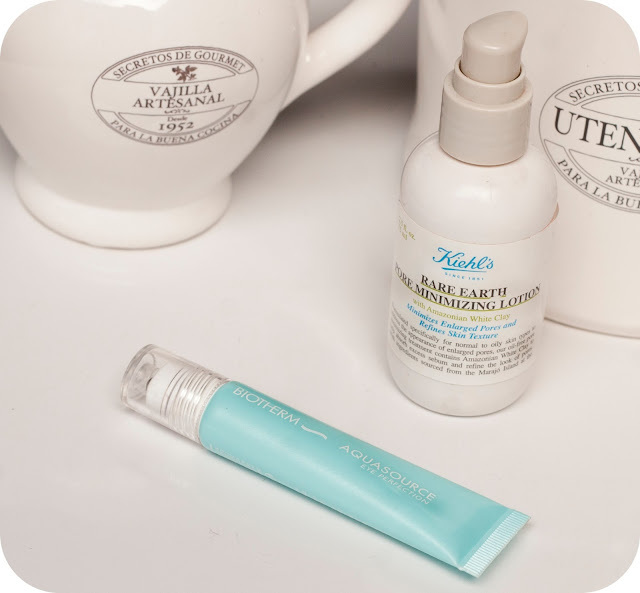 Moisturize and leave eye contour looking smoother and more unified." I don't know if my eye area looks more unified because it has always looked fine. The reason why I got this is because I have very sensitive skin and get allergies around my eye area quite often. I've tried many products, many moisturizers in order to get rid of those allergies and soften that area but nothing worked, only cucumbers! 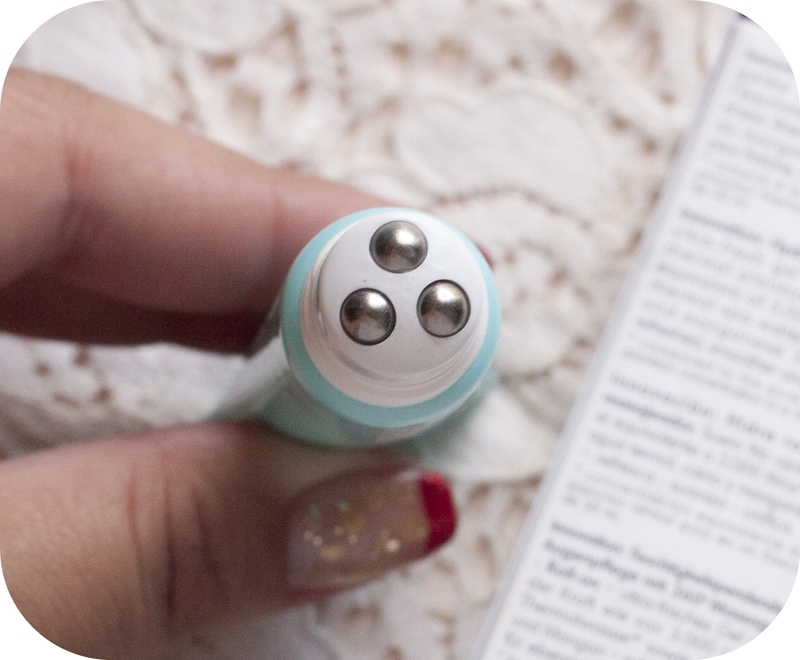 This product is a lightweight gel that comes out from three little metal balls that are meant to massage your eye zone and reduce puffiness. I think this is such a fun and useful product! So far no allergies, no tired eyes, no puffiness... I'm happy! "Un gel transparante que contiene plankton termal equivalente a 5000 litros de agua termal de spa, calcio y magnesio. Hidrata y deja el contorno de ojos mas suave y unificado." No sé con respecto a lo de unificado dado que mi contono de ojos siempre estuvo bien. La razón porque me compraron este producto es porque tengo piel muy sensible y siempre me agarran alergias. Trate varios productos pero solo funcionaba ponerme rodajas de pepino. Este gel sale de tres pelotitas de metal que estan hechas para masajear el contorno de ojos y reducir las bolsas. Me encanta este producto! Estuve buscando algo así hace tiempo! Por ahora no tengo alergías, ni bolsas, ni ojos cansados! Which ones are your favorite summer products and if you are currently on wintertime, which ones are in your wishlist? Cuales son sus productos de verano favoritos? Hace rato vengo usando el sistema de tres pasos de Clinique y me fue bastante bien. Igual siempre incluyo otros productos para no aburrirme! Love the look of the Aqua Source Eye Perfector, I like products that have the massage applicator. My favourite product for the Summer is probably a BB cream as they give a nice light and natural coverage - perfect for those hot Summer days! Gracias por compartir! Yo tengo la piel mixta como ya has de saber, y debes saber tambien que me estoy alejando (o intentando) de productos que no sean naturales... al menos para lavar. Tengo un producto de Avene que es parecido al de clinique (tambien tiene unos polvos en el fondo) y es matificante, lo uso una sola vez al dia porque tiene alcohol.... pero no me convence mucho. Es medio fuerte. No he probado nada de Kiehl's, pero todo lo que he oido de ellos es excelente! Hola Flo! Casi no leo lo que esta en castellano :P agrandalo un poquin :P El Aquasource lo uso y me encanta! these products sound great! I have been wanting to try kheils for a while now. It's summer where you are?! Jealous~ I've been looking for a very lightweight sunscreen for my face, but haven't found one so far, yet. great review! just did a post with that clinique product! Great post. I love the Clinique anti-blemish products too. But Im yet to try Kiehls, I really must! !